I was recently informed by NCTM that my proposal to speak at the 2014 NCTM Annual Meeting was accepted. That's the good news. Unlike last year, when the conference was held in my backyard of Denver, I hesitated to accept NCTM's invitation to speak because of the costs involved. Registration fees, hotels, and transportation add up alarmingly quickly, especially for a graduate student getting by on a modest stipend and student loans. 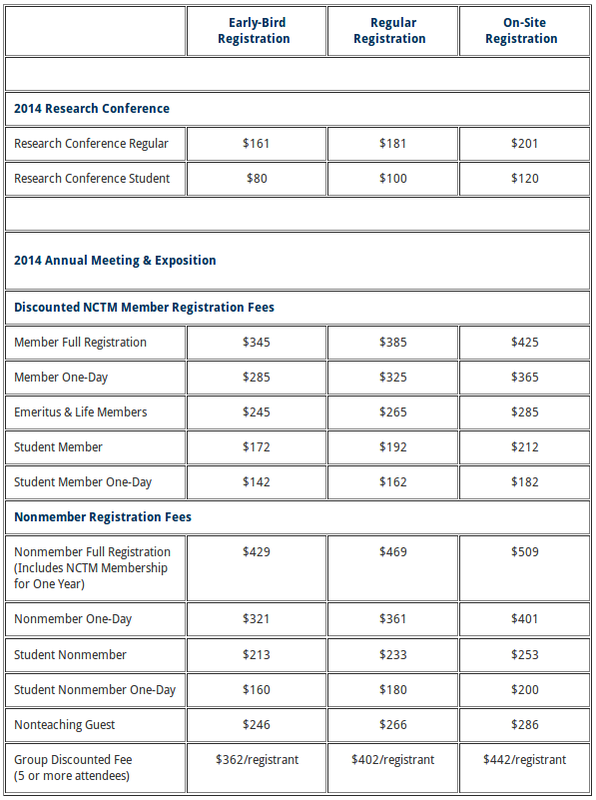 Fees at http://www.nctm.org/researchconf/, current as of 9/17/13. Do you see what I see? If I were a regular NCTM member, the full, early-bird fee would be $345, which means the $281 speaker fee represents a $64 discount. That's a nice way to show your appreciation to speakers, isn't it? But what about student NCTM members? My full, early-bird fee is $172, which means the $281 speaker fee represents a $109 penalty. Why is this? Does NCTM want to discourage students from presenting? I doubt it, but unless they get their fee structure sorted out that might be the result. I've emailed NCTM about this issue, and I hope they reply sensibly. Silly me did Step 1 before Step 2, which mean I accepted before checking out the speaker fee. Even worse, NCTM warns you that accepting then cancelling puts you in the NCTM doghouse and decreases the chances that any future proposals get accepted. Remember that recording of Steven Leinwand's talk I posted from the last Annual Meeting? That apparently is (or will be) against NCTM's wishes, as they state: "Written permission to tape or record presentations must be obtained directly from the speaker involved at least thirty days before the NCTM Annual Meeting & Exposition. The request must contain a statement indicating the intended use of such a recording or videotape. The person making the request should also inform the NCTM Headquarters Office in writing at least two weeks prior to the NCTM Annual Meeting & Exposition." I had Leinwand's permission to post the recording, but didn't get that permission from him in advance. If you aren't a lead speaker, but a co-speaker, your registration rate is $344. Yes, a $1 discount compared to the regular, early-bird registration rate. That's like leaving your waitstaff a nickel tip. I'm assuming this higher fee applies to students, too. Speakers must submit a written request to use any art related to the Annual Meeting. I can't imagine there's any real risk to just letting registered speakers download that from the password-protected speaker's website. NCTM's idea of "going green" is to pick up your program book when you register so they don't have to mail it to you. This wouldn't have struck me as strange 10 years ago, but it sure does now. Why not try this, NCTM: Tell everyone that program books will be available electronically, and those wishing a paper copy can pay an extra $5 with their registration. That way you'll have an estimate of how many copies to print, and be "going green" 2014-style. I received a reply this morning from Michael Barbagallo, Senior Manager of Member Services at NCTM. He said I can pay the student rate and not the speaker rate, but their system does not currently give me a way to register as a student until registration opens to everyone in November. For now I should confirm I will present (which I've done) and book my hotel room (uhh...can I just bring a tent and a sleeping bag to New Orleans? ), then NCTM will sort things out in November when I register for the conference. It sounds like there's no automated way to do this and according to Mr. Barbagallo, "we have few students who speak." To that, I say to grad students: I know the culture of academia and research tells us that presenting at research conferences deserves higher priority than presenting at teacher conferences. Cultures can be changed and good things often come when they are challenged.